Netplay is another area that is difficult to comment on. Demo servers are often of varying quality. I was able to test the game on a familiar server with an experienced server administrator and have to say that the game just feels more responsive online. Reportedly, the bandwidth efficiency has been optimized, making higher player loads play smoother. Raffi_B: While the difference is barely noticeable for broadband users, the UT2004 net code has been improved drastically. Server CPU usage has been reduced, bandwidth transfer has been reduced, and this results in a extremely playable game for people with all types of connections. Zenny: The creation of Official Atari servers is the best addition to UT2004. Finally not having to worry about whether or not I'll be able to find a decent normal settings server makes me want to click "Join Game" instead of "Instant Action" a whole bunch more. It's converted me from a predominantly offline player to an addicted online junkie. Much has been made of the improvement in the already top-notch bot quality. The Unreal Tournament series is known for its superior bot performance, and this is no exception. The bots jump, strafe, and move much more like real players. A bot will even toss it's translocator beacon and delay translocating if you turn to the beacon, shooing you in the back instead. It was nice retreating with the flag and having cover waiting around the corner holding off defenders as I made my way back to the base. Like human players, they'll often drive off and leave you in Onslaught. They aren't as crafty as human players, but whose bots are? These are the best in the business and make playing offline loads of fun. Raffi_B: Let’s just say, the new bots make Godlike SuperBots look like morons. .altan: I've been playing against bots exclusively due to my stone-age internet connection, and I can certainly say that the bot AI has improved since UT2003, like so many other things. Especially in Onslaught, the bots give me quite a hard time - on Experienced! I'm almost embarrased to admit that. It's also a fine sight when they scrawl up the ramps in DM-Rankin. Sparky: Bots are a big part of the game for me, as most of you know I’m unable to obtain a half decent broadband connection where I’m situated. Fortunately for me, Epic produced some of the smartest bots I’ve seen in a First Person Shooter. They work great with Onslaught, which was my main concern, although with that said I do have a few issues I’d like to address. First and foremost they are a little relaxed when it comes to powering up nodes. They seem to take the first two fairly well, but tend to give up after that. They also don’t seem to link up as much as I’d like either, maybe they’re out of ammo, but to me it seems they’d rather hop back in their vehicle and drive off after a quick kill (This ain’t DM boys). The strangest issue on Torlan is that nine times out of ten they don’t even attempt to jump in the HellBender, so in retrospect it’s just left there to drop oil and look pretty. Adding some new voice commands, for example ‘Charge the node’ could rectify this situation, and from where I’m sitting I don’t think it’d be that much of a marathon either. I’ve also noticed they sometimes get stuck behind the Turret which is located above the Power Core. This to me is a little disappointing, but easy to fix. Gameplay is so subjective that I can only describe to you how the game feels and can only rate it based upon whether or not it succeeds in hitting the "fun" mark. It's clear that the idea for Unreal Tournament 2004 was to take the best of what worked in the previous two Tournaments and marry them with some of the new "in-demand" vehicle gametypes from such games as Battlefield 1942 and Halo. But it doesn't just stop there. This is no hollow copy of a copy. There is plenty of depth and strategy to be found in the new elements of the game. The new vehicles and weapons, while semi-conventional, fit right in to the Unreal Universe with their complexity and handling. The dual weapon modes (mentioned above) give the vehicles that Unreal feel. Nice surprises abound: Shoot a Raptor out of the sky with the tank and you'll be rewarded with a thundering "EAGLE EYE!" announcememt, pull off an impressive jump or flip in a vehicle and witness your scorecard (a la Tony Hawk or the SSX series), flattening pedestrians will get you a booming "Pancake!" or "RoadKill!" announcement, or try stealing a vehicle from another team and get greeted with a piercing car alarm! It's clear that Onslaught is the star of this show and that attention to detail was heavily lauded it. If you liked Bombing Run, Capture the Flag, or DeathMatch before, you'll like it again. These gametypes stay true to their roots and benefit from weapon balancing, more open maps, and voice chat. Bombing Run fans were worried when Epic announced that they were going to cause the Bomb carrier's translocator charges to drain when the ball was passed... until another player caught it; the point of this being an attempt at taking away self-passing (which totally misses the point of it being a team game). A mutator or game option is reported to be in the retail version that will allow or disallow self-passing. Overall, the game feels tight and focused. The extensive playtesting has obviously paid off. Raffi_B: Overall, the gameplay is excellent. The “feel” of the game is more like the original UT, which is a great thing in my opinion. 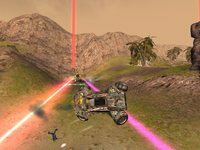 UT2003 was too much of an in-your-face sporty game, and I’m glad to see Epic go down to their roots and dig up a fantastic game. Zenny: After playing it constantly since it came out, I still sometimes get the feeling that I am playing UT, but then I see the scenery and remember where I am. I really like this feeling, and it means that Epic got this attempt at a sequel for UT right. This game should be considered the true sequel to UT. .altan: Following countless hours of playing against the computer, I've got to say that this is it - it's not UT, but Epic has hit the sweet spot, the very sweet spot that was hit five years ago. Not to mention the humour and lightheartedness added by the commentators: "PANCAKE!" is gold. Sparky: At first glance Unreal Tournament 2004 could be looked upon as UT 2003 with a few new additions and some fancy new artwork. That sentence is wrong in so many ways, believe me. When I first got the Demo (Also known as ‘teh Demo’) I took DM-Rankin for a test spin and it only took me 3 steps and a jump to realize the game felt different, for the better I might add. It brings back the old feeling of Unreal Tournament and pretty much removes the sporty feel of UT 2003, I can’t begin to tell you how much this means to me. Weapons are more effective, maps have been designed with gameplay in mind - I can’t help but feel UT 2003’s were simply showcases for the engine bar a few, Antalus comes to mind as being one of the few that actually played well (I for one can’t wait to test this in the retail version, should be a blast). Most importantly unlike UT 2003, I feel this game will actually last a while. It took me pretty much three weeks to get over the luxurious graphics the new engine produced last year and from there on in I started noticing the game was lacking in every other department – Gameplay unfortunately suffered the grunt of it. Unreal Tournament 2004 has thankfully rebuilt my confidence in Epic, as harsh as that may sound. Unreal Tournament 2003 was a mistake, nothing more than an Engine showcase; I know I’m not alone with that comment and that to me is a little scary. Since the release of the demo I’ve found it extremely hard to concentrate at work, there are probably only 30-minute gaps where I think I’m not actually in game-mode. That to me is great, but a little worrying at the same time (Please don’t put me in one of those white jackets, I swear I’ll be good). Bring on the Retail release Epic, I for one can’t wait!